I'm not paid as a scientist anymore, but I do enjoy the tools of the trade. My newest acquisition is an IR laser-guided thermometer. Just measures surface temps, but it's fun, and the cat loves it. I got it primarily for the firedome; I wanted to know how the temperature and uniformity of the clay cooking surface compared to the dome temperature. I also want to smuggle it into pizza places and check their oven temps. It stabilizes in about a 1/2 second and the range is -76°F to 1022°F. I wanted a higher temp unit, but this'll do for a while. Wow...now that is one awesome tool. I've been running around all day measuring stuff. I look ridiculous. I was able to find a spot on the kettle dome during a pork shoulder smoking that was equivalent to the dome internal temp. Pretty handy. Can't wait to fire up the pizza cooker. Unrelated to this post, BUT, I was so amazed to see "EPIC BAGUETTE - Director's Cut" released that I had to say something; has Frankie signed her contract with Dreamworks yet??? 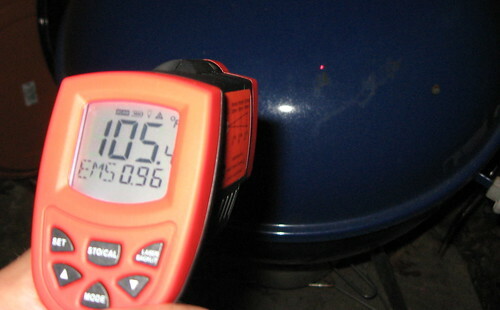 I have a fancy laser thermometer and it is way Kool. I do not think I would bring it to a pizza parlor. They might think you are the health inspector and halk a lougie in your pizza. Hey Mike, I haven't stopped pestering people with it. It's fun. Hey Mats, thanks for the compliment, the kid's enjoying the spotlight these days. Chile, excellent point. I think I'll keep the measurements to my home. Temperature Meters Rental Measuring surface temperature does not really need to have physical contact, it can be measured also through IR thermometer.